In these days of massive budget deficits it would sound pretty strange if a politician authored a bill that would cost the Federal government $150,000,000 in beer excise revenue and tens of thousands of jobs. That number is especially shocking when you consider that the average price of a six pack was 40 cents. These severe consequences would not deter one congressman from Minnesota’s 7 th district and that man’s name was Andrew Volstead. Volstead is best remembered for the bill bearing his name that prohibited the manufacture, sale, transport, import, or export of alcoholic beverages. Known as the Volstead Act; it began some of the darkest thirteen years in American history known as Prohibition. The problem is that while this act bears his name; Volstead himself was likely little more than a figurehead. So what do we really know about Andrew Volstead? Andrew Volstead was born to first generation Norwegian immigrants on October 31 st 1860 near Kenyon, Minnesota. 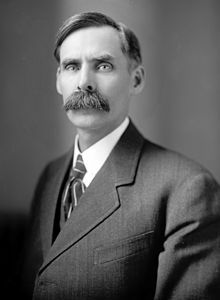 Educated as lawyer in Decorah, Iowa, Volstead and his family moved to Granite Falls in 1886 where he served as city attorney and later mayor until 1902. In 1902 he was elected to congress in Minnesota’s 7th district as member of the Republican Party. While serving in public office Volstead became increasing involved in the civil rights movement and was one of few politicians willing to argue for legislation banning lynching. During the Progressive Era civil rights would become increasingly entangled with the temperance movement. The temperance movement was backed by very vocal groups, though in the minority, the Woman’s Christian Temperance League and the Anti-Saloon League. The Anti-Saloon League, headed by Wayne Wheeler, used bullying tactics to apply pressure on politicians to support prohibitionist measures. Aided by World War I Wheeler began a campaign to align the big brewers with the German enemy since most were of German decent; Schlitz, Pabst, Busch, and Miller. In 1919 Wheeler saw his moment and wrote a piece of legislation authorizing national Prohibition. Though Volstead never admitted it, he was likely not the main author of Prohibition. As the chair of the judiciary committee it fell to him to sponsor the bill before congress. This action would cost him his seat in Congress in 1922 as it was largely unpopular with a majority of Americans who considered it violation of their constitutional rights. Prohibition was repealed 80 years ago this Sunday and signed into law by President Roosevelt. At 12:31 AM on April 8th, 1933 the White House received cases of beer from many of the countries remaining breweries. Though Prohibition has been over for 80 years the country is still feeling the effects of the poorly named Nobel Experiment. So while Andrew Volstead may receive more of the blame than he is due, Minnesotans can still thank him for 3.2 beer, dry Sundays, and restrictive brewing laws. This Sunday we should all raise a glass of beer, well at least those of us who planned ahead, and have a drink to celebrate the end of the Volstead Act.